Brian Keene first managed to catch my eye with The Conqueror Worms in 2006. I even remember the first time I saw this novel; I was walking down the center aisle of my local Barnes and Noble, and there it was, chillin' on the round center display that houses newly released mass-market paperbacks. The book's cover featured an image of scary-looking killer worms devouring an entire city. After visiting Barnes and Noble several more times that spring, I finally gave in and bought a copy. I was hooked on Brian Keene's novels from that day forward. In Castaways, a group of reality show contestants are competing against one another to be the last person left standing on a small island. In the style of Survivor, contestants vote for the person they want banished from the island, and the last person who remains after completing all the challenges and without being voted off the island is awarded one million dollars. When tropical storm Ivan threatens to ravage the island, the contestants are left behind without radio contact with the show's producers. It's only then that the contestants learn that the island actually isn't deserted at all, and are forced to survive and protect themselves from the monstrous indigenous people who are beginning to take out the contestants, one by one. 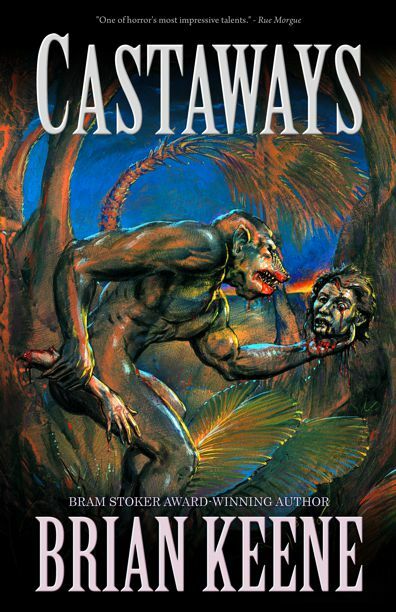 Castaways is one of many books in its genre I refer to as "horror candy." During my time with Castaways, I was desperate to pick up where I left off and lose myself in Keene's horrifying world. The novel is jam-packed with action, and contains a few red herrings that legitimately took me by surprise. My favorite character in Castaways is Matthew. His diatribe into government conspiracy, corporate America, and pop-culture will likely be found agreeable and interesting to most (they are to me!). I even mentioned my thoughts about the views expressed by Matthew on Twitter, to which @BrianKeene replied, "That was the fun part of writing that character." I love it! I bet it certainly was. 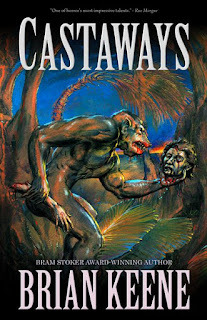 The monsters who terrorize the contestants in Castaways are incredibly freaky and scary - especially for women readers. I conjured up my own images of the monsters based on my personal visits to the Museum of Man in San Diego, which was home to several naked cavemen and "evolution" exhibits that gave me nightmares after I saw them at the age of 9. Let's just say hairy, bulbous, deformed penises are involved, and leave the rest to your imagination, or to Keene's own explicit descriptions of them in Castaways. Everything about Castaways is satisfying - from the plot, to the surprises, to all the elements of horror. Fans of this genre and of Brian Keene should definitely not miss out on Castaways. Upon finishing this novel, I closed it with a smile on my face, thinking this was exactly what I needed to satisfy my October horror-reading fix. Some of Brian Keene's most recent novels are An Occurrence in Crazy Bear Valley, Entombed, A Gathering of Crows, and Urban Gothic. What are your favorite horror novels? Who are your favorite horror novelists? Share your thoughts and comments with us below!